A "new look" for Prada? Well, I suppose so, but it doesn't really matter. The New Look Zip-Top Tote's fresh beige color is perfect for resort season as well as spring and summer. This roomy, relaxed dome-shaped tote is a classic in the making with its' buckle-detailed straps and gathered bottom. Jet off on a winter getaway toting this practical Prada design secure in the knowledge its' $1830 via Neiman Marcus price tag translates into a sound handbag investment. For the ladies who simply must have a black bag in tow wherever they go (yes, I know you're out there! 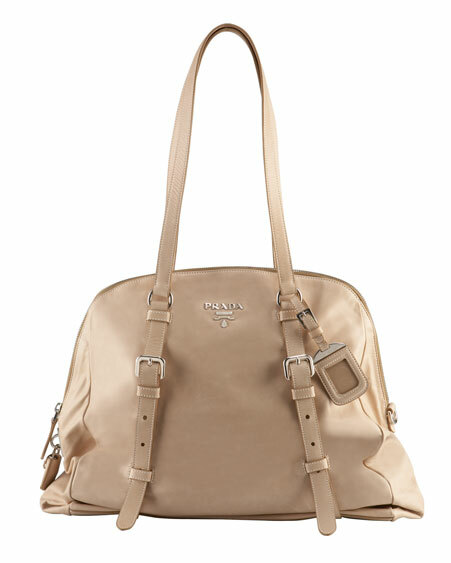 ), Prada provides the handbag collector's closet staple color in this lovely design as well. Perhaps Prada could change this tote's name from 'New Look' to 'Haute Look'. A more appropriate choice, don't you think?